My life and views on everything from living with facial disfigurement to how I view the world. Clodagh Finn speaking at the Cork launch of her book. I collect signed copies of writers’ books, something that happened casually and has now expanded into a nice if small collection. Some signings are easy to acquire, a few demand some patience, while others just fall into my lap. I wrote about my first efforts here a few years back. 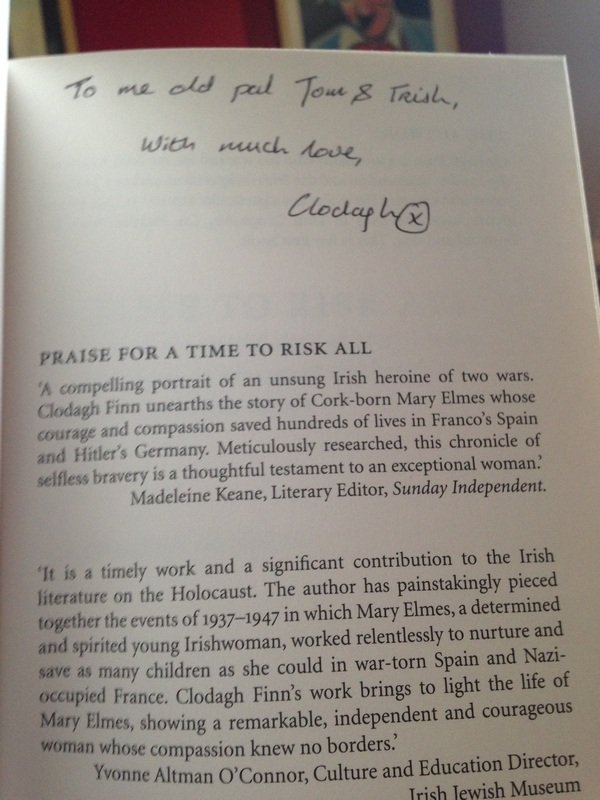 I knew Clodagh Finn’s biography of Mary Elmes, A Time to Risk All, was out, and while I had every intention of getting a copy in the run up to Christmas, there was a little more urgency when an invitation to the Cork book launch arrived from Clodagh. I hastened to buy a copy and brought it along to Cork City Library last Monday evening where Clodagh, a very fine colleague who used to work with me in the Cork Examiner Editorial, duly signed the book. 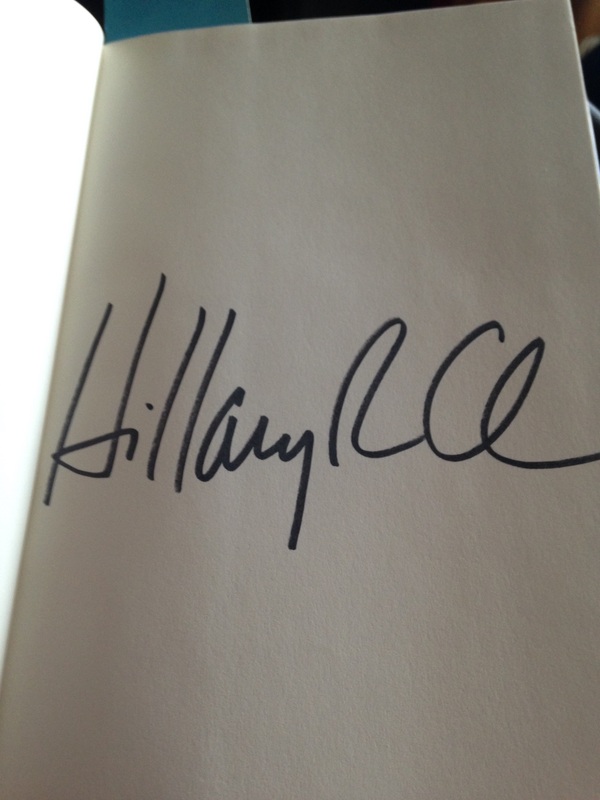 My son Daire sent me a birthday present of Hillary Rodham Clinton’s Living History (I’m currently reading it), which is the only political autograph in my collection. 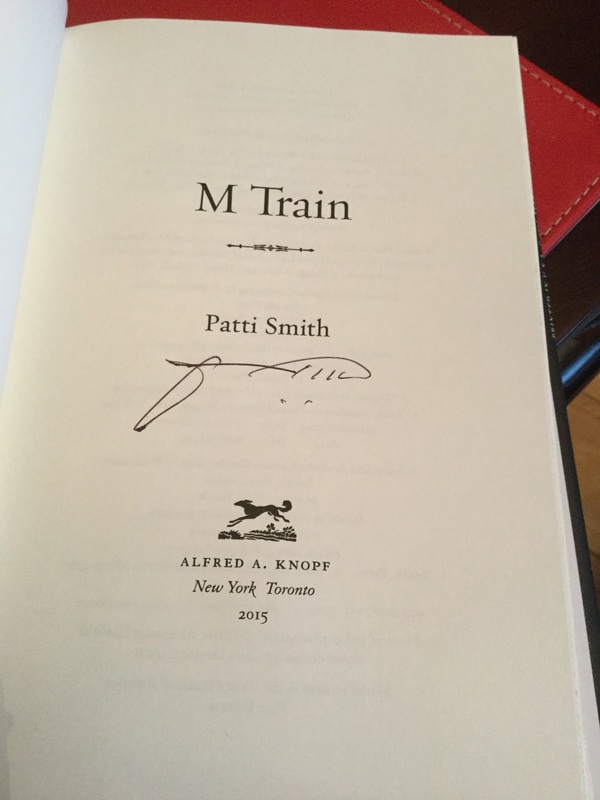 Patti Smith’s M Train was bought in New York. I was visiting Daire and we were browsing Barnes & Boble’s 5th Avenue store when I spotted a reading by Smith the following night. We planned to go, but tickets for a private preview screening of Steve Jobs, followed by a Q&A with director Danny Boyle and Alan Sorkin, came our way and that was that. The following day we were poking around a small bookshop in the East Village when I spotted a signed copy of M Train. Fate or what? Some signed copies are easy enough to find: they just lie in shops waiting for you to buy them, which is how I ended up with the autographs of Donal Ryan and Jeremy Paxman. Marlon James’s signed copy of A Brief History of Seven Killings I came across in a London bookstore while on a flying visit to London. 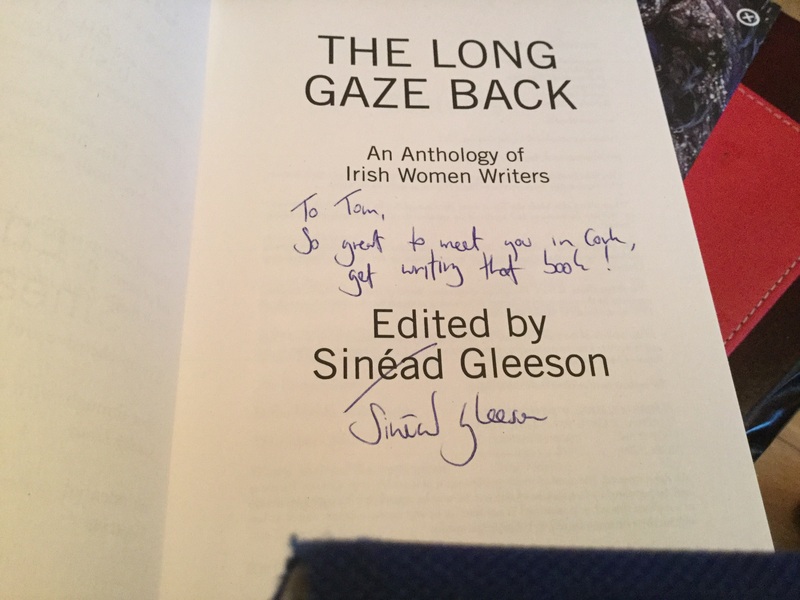 I ‘met’ Sinead Gleeson on Twitter, which is a great place to meet writers. Sinead has been very encouraging of my own blog and my efforts at writing a book. 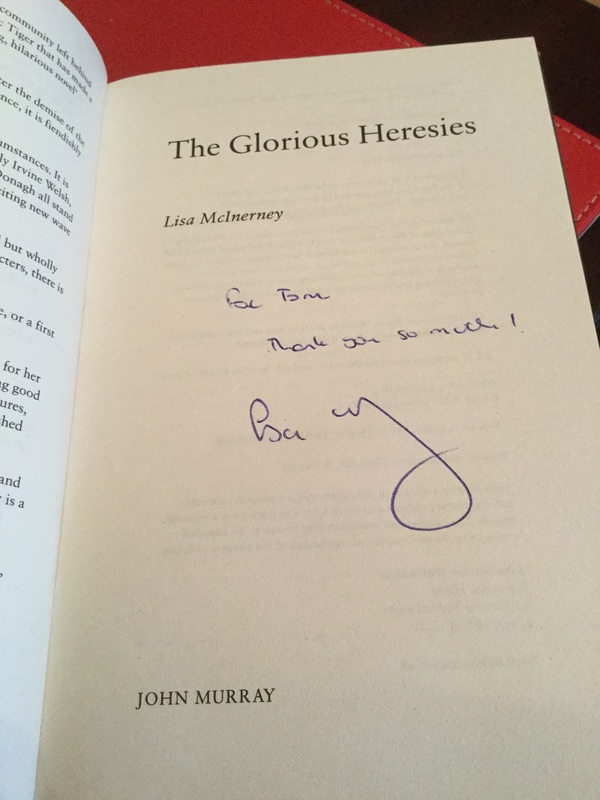 She also edited The Long Gaze Back anthology of Irish women writers which I really enjoyed, so when I heard she and Lisa McInerney, another Twitter pal, and writer of The Glorious Heresies, would be in Cork a few months ago, I rushed along and got my reward. I read Sara Baume’s Spill Simmer Falter Wither on my iPad via Kindle. When I finally ran into her at a reading in the Triskel I introduced myself – I know, I have no shame – but had no book to get signed. 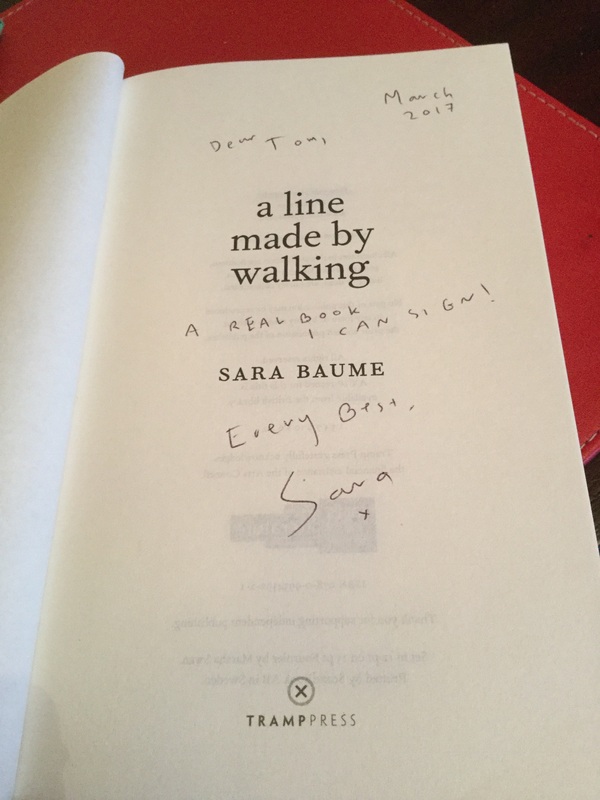 Earlier his year I remedied that when I bought A Line Made by Walking, approached her like a star-struck schoolboy at a reading in Waterstones. Her message summed up the saga! Right now I’m in the process of getting another signed book, but all I can say is that the author lives in New York and is awaiting delivery of the copy before it’s whisked back to Ballincollig! Such drama!